On the Burn-in > Positioning options page there is a set of spin controls for each metadata item which allows you to set its position horizontally (X %) and vertically (Y %). These controls only work in Advanced layout mode (see the Options - Burn-in section). The horizontal and vertical values start at 0 at the bottom-left of the video frame and increase to a maximum of 99 at the top-right. The X and Y positions are expressed as a percentage of the video width and height. This is because the pixel dimensions of the video frame can vary widely depending on the video format, so using percentages rather than pixel dimensions allows us to be more consistent with size and positioning. As an example, a frequent requirement is to burn-in only the recording date and time using the Burn-in Time Stamp tool. Advanced layout allows you to position the date and time anywhere in the video frame, using any font and size that you wish. And this works for DV, HDV, AVCHD and supported MPEG-2 PS, MOV and MP4 file types. The group of 5 controls near the bottom of the Positioning page are used to set the position of the GPS Geotagging items. These only apply to AVCHD, GoPro or Contour video cameras (and iPhone) that are equipped with GPS units. They also apply for Sony AVCHD cameras when they are set to standard definition mode and create MPEG-2 PS files. The Custom text control sets the position of a user-provided text string, and Logo image sets the position of the bottom-left corner of a user-provided image file - see the Options - Burn-in Appearance section below for more details. •Automatic (recommended) - this sets the orientation of the burned-in text to match the orientation information (if present) in the input video file. •Landscape - regular landscape orientation. •Landscape 180° - upside-down landscape orientation. •Portrait 90° CCW - portrait orientation, rotated 90 degrees counter-clockwise. •Portrait 90° CW - portrait orientation, rotated 90 degrees clockwise. 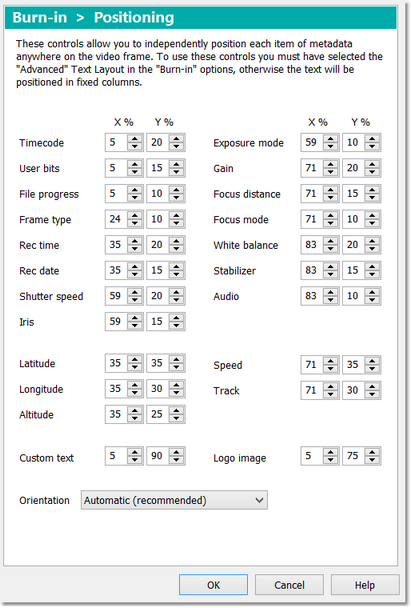 The Automatic setting will try to choose the correct orientation for the burned-in text if the file contains orientation information; otherwise it will use regular landscape orientation which is how video is usually shot. The other 4 settings allow you to set a specific orientation manually. The vast majority of correctly-shot video will be in landscape orientation, so you should leave the orientation set to Automatic. Only choose one of the other 4 manual settings in exceptional circumstances, such as when the camera was held vertically (i.e. in portrait) but it did not store any orientation information in the recorded video file. For more details about portrait and landscape orientation and how this is handled in DVMP Pro, see the Portrait Oriented Video topic. When you first start DVMP Pro, a set of Positioning settings is automatically selected to get you started. You can then adjust them to suit your requirements. When you are experimenting with positioning, choose a very small file to burn-in, then you won't have to wait long to see the results.